I’m here to encourage you … Yes, you CAN do it! And not only can you do it, you can THRIVE – not just survive – during your Whole30 Journey. The key to successfully completing the Whole30 program is not only to maintain a positive can-do mindset, but to also be sure to follow these five simple tips for success! P.S. You don’t have to fly solo! I’ve put together an incredible collection of free helpful resources and support to make your 30-day journey a delicious success! Join my May 2018 Whole30 Community for exclusive, free, subscriber-only Whole30 meal plans, recipes, resources and lots of encouragement! Yes, I know that you’re supposed to work toward eating just three meals a day (plus an extra bonus post-workout meal for those who are exercising). But it may take you a week (or even two) to get to that point. So don’t completely overwhelm and shock your body with just three meals a day the first few days or week of the program, especially if you’ve been a “grazer” your whole life. Yes, I know some of you want to lose weight. But how many times does the Whole30 team have to tell you to stay off of the scale? So I’m going to remind you too – stop weighing yourself and just eat the healthy foods on the program. If you start starving yourself in an attempt to lose weight, you’re only setting yourself up for failure. So don’t do it! Walking around hungry all day is not going to help you. When to eat / How much to eat? “Am I hungry enough to eat some grilled fish and veggies right now?” If the answer is yes, you’re truly hungry, go eat a healthy snack. If the answer is no, you’re just having a craving, so go find something else to do to take your mind off of it. Then, at your next meal increase the amount of food you eat, particularly fat and protein and see how it goes? Are you hungry again before your next meal, then you’ll know that you need to increase the amount of food a bit more. Are you not feeling hungry when your next mealtime arrives, then you need to eat a little less next time. But always make sure to eat the minimum requirements to ensure adequate nutrition. (See “How to Plan a Healthy Whole30 Meal.”) By making simple adjustments as you go, you’ll eventually get to three (or four) meals a day. P.S. Don’t miss my FREE Ultimate Whole30 Success Guide – it will make your 30-day journey a whole lot easier and more DELICIOUS! 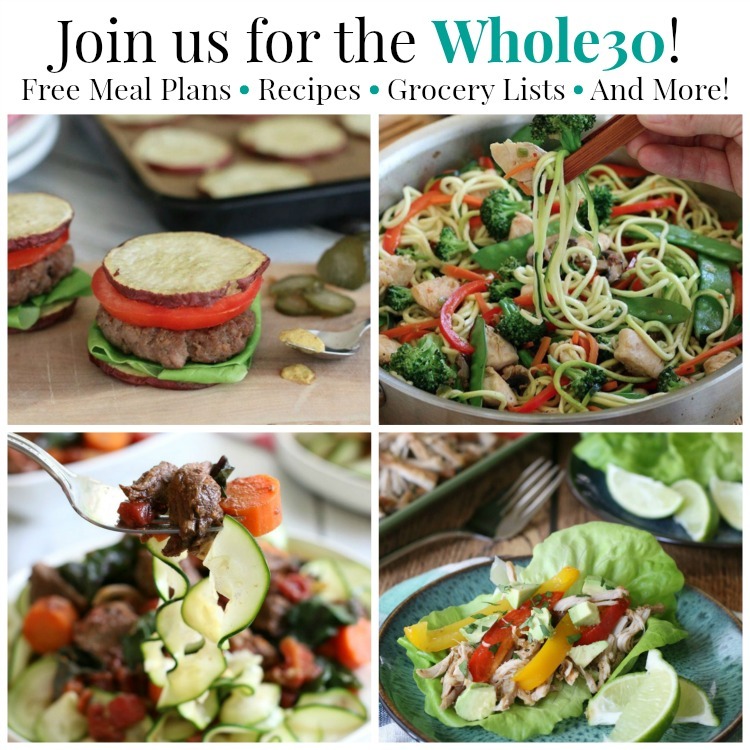 This special subscriber-only resource provides free Whole30 recipes and Whole30-friendly meal plans with shopping lists and recommendations for prep-ahead tasks that make getting a healthy meal on the table a snap! 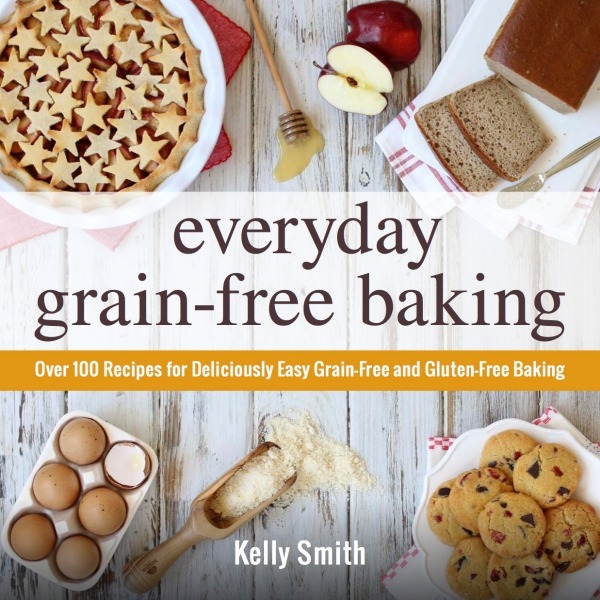 Plus, you’ll receive lots of Whole30 success tips and encouragement! So I’m basically giving you permission to eat a snack if you’ve determined that you’re truly hungry. But it’s not just my opinion, the Whole30 team agrees. Again, walking around hungry all day is not going to help you. However, you need to rethink snacks! Here’s what we typically think of when we think “snack” – lots of carbs and empty calories, such as crackers, chips, bars, cheese sticks, commercial fruit yogurts, etc. Wipe those from your memory. You now need to think of snacks as small Whole30 meals. These are just a few examples of the types of snacks I’ve eaten when I’m truly hungry, and you know what, it’s helped me tremendously to not cheat and actually enjoy the Whole30! So remember to first evaluate if you’re truly hungry, and then choose a healthy whole food snack with a good balance of protein, fat and carbs. Health Tip: If you’re experiencing sugar withdrawal, you will find yourself feeling especially “hungry” – but again, not for something healthy like a piece of grilled fish and veggies. So what can you do? A healthy way I’ve found to beat intense sugar cravings is to sip a cup of warm tea. My personal favorite is Rooibos Tea because it’s soothing vanilla scent and flavor calms cravings. Rooibos, also called “red bush tea,” is naturally caffeine-free, and provides many health benefits since it’s rich in antioxidants, minerals and flavonoids, which help to reduce inflammation. Tip 2: DRINK a lot of water! The point is, you want to avoid becoming dehydrated, since dehydration leads to headaches, fatigue, constipation, and other uncomfortable symptoms. Plus, you want to help your body flush out the toxins it’s releasing due to your pure whole food diet. But don’t go crazy and start forcing yourself to drink excessive amounts of water, as that can lead to extremely low sodium levels in the blood and cause a dangerous condition called hyponatremia. Fact is – most of us could benefit from drinking more water, just be sensible about it! Health Tip: Create “spa water” by adding slices of lemon, cucumbers and berries to your water. This will not only naturally flavor your water, but also provide added nutrients and enyzmes to aid digestion and help flush out toxins. You’re body is being put through the wringer – toxins are being released due to your new pure whole food diet, your brain is reeling trying to figure out what happened to its emotional and physiological comfort foods, and you’re therefore suffering both physically and mentally, especially if your diet previous to the Whole30 wasn’t very close to how you’re eating now. So get to bed early and get some sleep – at least 7-8 hours a night, if possible. Sleep helps the body heal and it will provide you with more energy for the energy drain you may be feeling (especially during weeks 1-2) as your body learns how to properly fuel itself without the bad carbs and sugar it may have been accustomed to previously. But go easy the first week. See number 3 above and cut yourself some slack, especially if you’re one of those ultimate-exerciser types. And if you haven’t been exercising at all, taking a daily brisk walk will get your body moving, which will help you feel more energized (counter-intuitive but true), and get your blood pumping to better help your body flush out those toxins. Slow down and take time to pray and meditate on God’s Word. Studies have shown over and over again that meditation relaxes the body and reduces stress. And by the way, meditation doesn’t just refer to sitting around chanting a word or phrase over and over, the word “meditate” simply means “to think on.” So think on why you’re doing this and even more important express your thoughts to God and ask Him for help and guidance. You’ll be much more successful in everything you do as you seek the Lord first and His will for your life. Bonus Tip: KNOW WHAT TO EXPECT! Knowing what to expect during your Whole30 journey can be a source of great comfort, validation and encouragement to keep moving forward. So be sure to print out this document and keep it handy. It can be very helpful to remind yourself “I’m not the only one.” Hang in there! You CAN do this! So, there you have it … my five tips for not just surviving the first week of Whole30, but THRIVING during the entire 30-day program. I’m so happy we’re doing this together! Be sure to share your thoughts as well (in the comment section below) on how to not only survive, but thrive on Whole30! And remember, if you haven’t already, be sure to subscribe to my Whole30 community for free meal plans and recipes to make your 30-day journey easier and a whole lot more FUN! Let’s look at the advice about water again. You suggest half your body weight in water. I weigh about 180 (yes, too much, I know!). If I followed that advice I would need to drink 90 pounds of water. This amounts to about 22 quarts. A pint is a pound the world around, so 90 pints divided by four. Thank you for all your helpful tips for the Whole 30, this is my 3rd attempt at a whole 30. The first time I quit at day 4 because I thought i couldnt be a good mom to my girls, Ages 3, 5, and 7, and they didn’t really understand why I was irritable. The second one I made it to day 17 and my husband helped convince me we had learned enough but it was too hard to keep track of everything and so we quit. This time I refuse to quit, I will complete at least one whole 30. Every time I have attempted one it has caused us to change a food habit for a healthier one so it wasn’t a complete waste but I want to experience the “Tiger Blood” week. I have a better plan this time and also a lot less crazy of a schedule so I know I will be successful. By the way. I made the Veggie Hashbrown Quiche and loved it. I’m on day #5 of Whole30 and I’m finding it so easy!! Never thought I’d say that!!!! But, we’re going out of town next week and will be facing a family dinner in which pasta, cheese, bread and dessert will be served and absolutely NOTHING on the plan will be offered. Any suggestions on how to handle it? As far as what to do about the family dinner? The great thing is, you know in advance that this situation is coming up. I would recommend calling your family ahead of time and explaining that you’re on a strict elimination diet for your health, and that you can’t wait to participate in the family gathering and spend time together, but unfortunately, you’re going to have to pass on the food because you are taking time to get a handle on your health. You might get a little kick back, but I find that most families love each other enough to respect and support each other. If fact, I recommend letting them know you could really use their support, because this is hard and you would love to participate in the family meal, but you need to say no right now. As far as what to eat, since you’re with family, I’d request someone to take me to the market so I can pick up some compliant foods and I’d offer to make a side dish for the family meal that everyone can enjoy, and also grab some easy foods you can put together to get you through this visit without compromising your whole30. 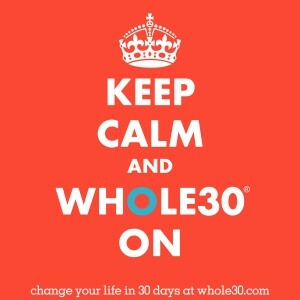 You’re not the only one to have to travel during whole30, it’s actually common since this is a 30-day program. Our friends at whole30 have a great quick reference guide that I recommend: http://whole30.com/downloads/whole30-travel.pdf to help you think of simple meals you can grab to get your through your time away from home. I joined your recent Whole30 you are starting and had a question. I know I am over weight because I eat to much at a meal and then snack here and there with the kids. So knowing while on the Whole 30 how much at a meal I should. What should our portion size be. Is there a certain measurement or some way to regulate how much I am eating a a given meal? I am just so not able to be trusted to eat just what I need. I just don’t know when to stop. Does that make sense? When does it officially begin? Do we get emails throughout? or should we more visit your blog or facebook frequently. I have 5 small children ageing between 2-8.5 myself and my husband do you think if I double your recipes that would be enough for us for a meal? CAn I use other recipes from your blog to replace any that we can’t eat from your meal plan kit you sent over? We dont eat pork for religious reasons. Thanks for any help or input you may have. I am so sick of being over weight and just need to make a change. When the whole30 is over can we keep doing the same thing? Like repeat your meal plans or something like that. Thanks again and I look forward to hearing back from you. I forgot to mention I already eat like Weston A. Price way. I am not coming off the SAD, if you know what I mean. Thanks again. Thanks for all your info! I’m doing the Whole30 for the first time and very nervous but excited.Are Lara bars compliant with the program? Are Lara bars compliant with the whole 30? I am on Day 4 and feeling great. I have been experiencing bowel movements (pretty loose) with uncomfortable cramping at 9:30/10 pm. Is this normal? Could it be all the vegetables this week?